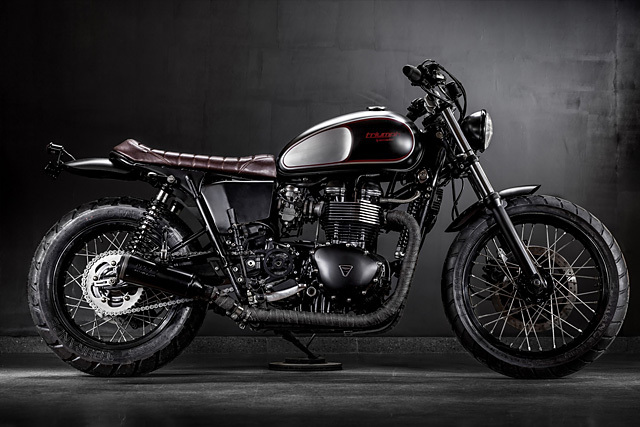 When you live in the UK and want to customise your very English Triumph Bonneville to a high British standard you send it to… Spain? For owner Daniel, that is the path he took having seen the work of Spanish builders Macco Motors and the results speak for themselves. 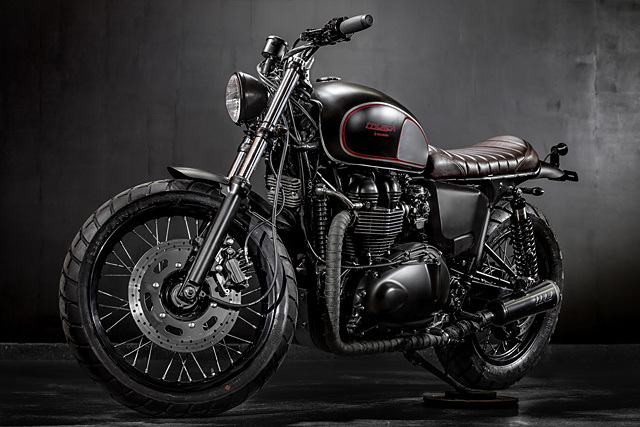 A classic Brit built in Spain with parts from around the world; it exemplifies the global community the custom culture has become and the result is one incredible 2006 Triumph Bonneville T100 named “Steadfast”. Daniel had previously performed some modifications of his own to his T100 having fitted some M bars and pipes from Norman Hyde. But simple changes were never going to be enough to quench Daniel’s thirst for something truly unique and having seen their work he knew Jose and Tito from Macco Motors were just the men to build his machine. 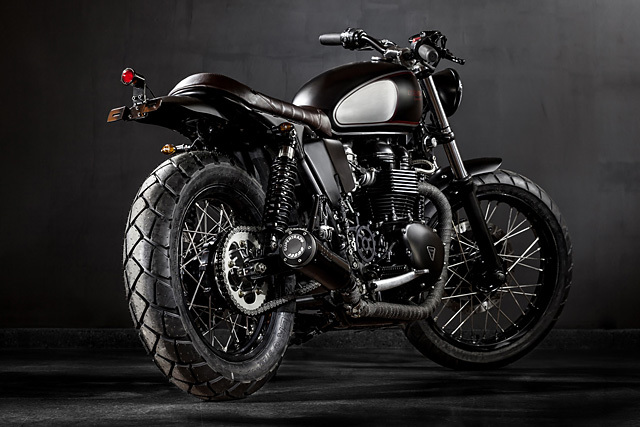 The Macco Motors boys got to work on a design that was based on their previous Triumph work but with a darker and more industrial look to better suit Daniel’s requirements. It was love at first site and with the bike now in Spain work commenced immediately. The tank is the centre piece, with classic double pin stripes separating the industrial matte black from the raw metal finish. Wanting to use their signature leather seat Macco first needed to fabricate a custom subframe to suit the new setup and to give the bike a cleaner look. 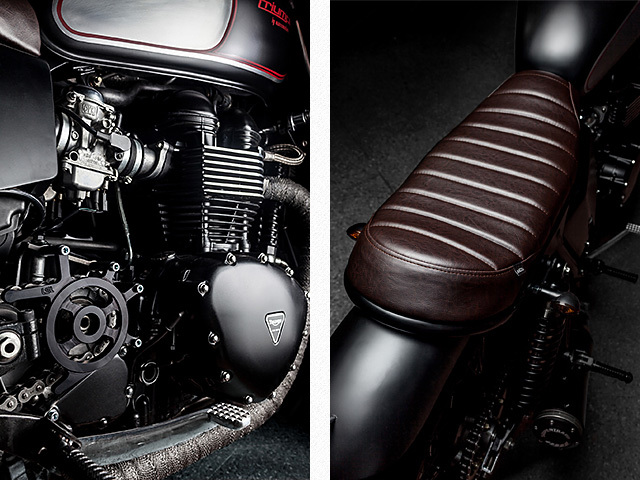 The leather seat is trimmed in Macco’s favourite colour leather that gives the Modern bike a vintage look and further enhances the T100s industrial credentials. 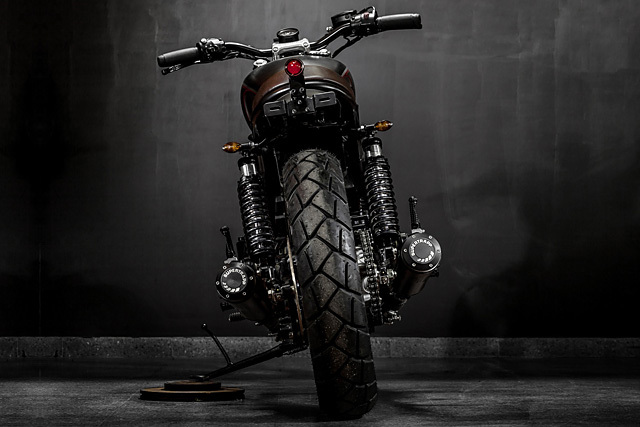 The new subframe holds the Macco built rear mudguard supporting a classic look taillight out back. 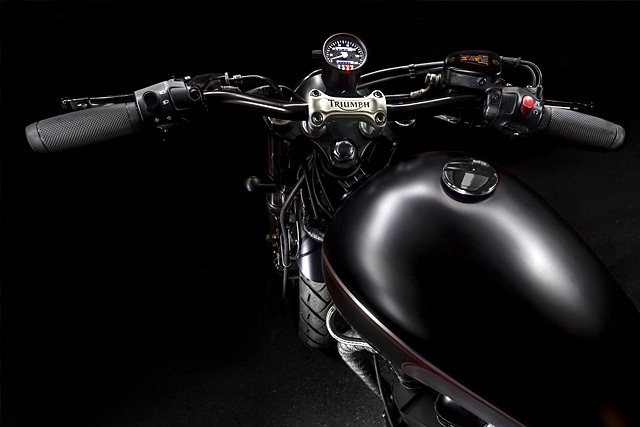 Nothing says custom Triumph like a Bates style headlight and new bullet indicators clean up the overall look. 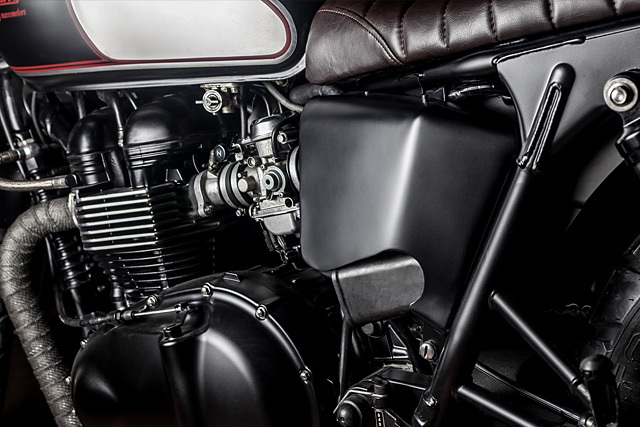 Completing the finish is a handmade fibreglass front guard and Macco side covers specially built for the T100 to show off some of the functional components while still hiding the electrics. Wanting a bike that performed as well as it looked Daniel had Macco install a set of progressive rate springs in the front forks by Hagon working in unison with the adjustable Hagon Nitro’s out back. The final contact point with the road is left to the beefy front Metzeler Tourance tyre with a matching 140 section rear Metzeler Tourance laying down the power. And while Daniels T100 hasn’t been given a full engine build there are a few more ponies thanks to the aforementioned pipes that are now heat wrapped and matched to the colour coded SuperTrapps. 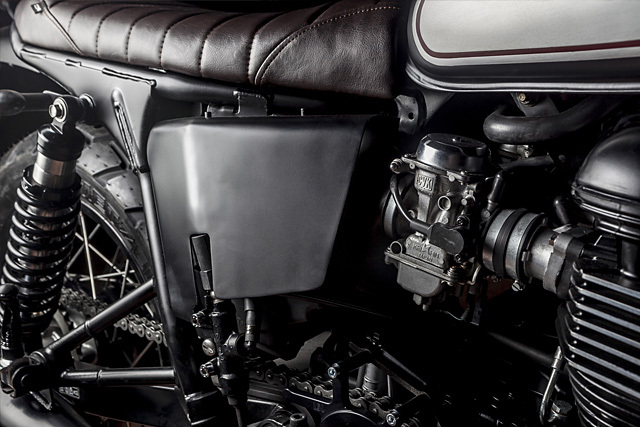 Jumping aboard the Triumph Daniel now takes control thanks to a set of Biltwell Tracker handlebars with matching Biltwell grips to absorb the vibrations. The single speedo provides all the information needed to avoid a speeding ticket and the built in warning lights give the front end an ultra-clean look. The race style levers not only look the business but make grabbing a handful of brake or clutch a much quicker prospect and the alloy footpegs keep riding boots in place in all sorts of climactic conditions. Keeping Daniel’s leg safe but finishing off the build in the black industrial theme is an LSL sprocket cover. 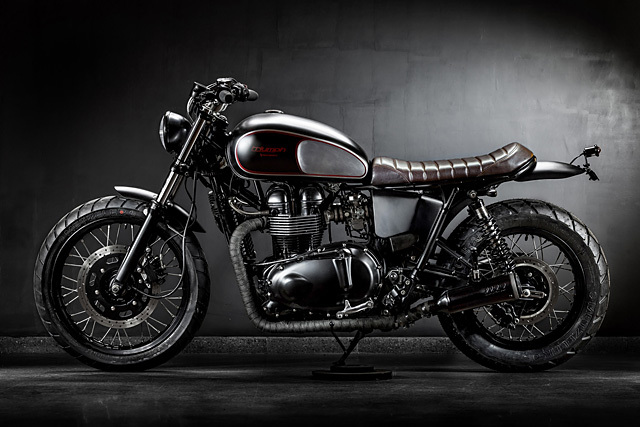 With the bike completed the gamble of sending a British motorcyle to a Spanish workshop has absolutely paid off. Jose and Tito have built just the bike Daniel desired, designed to his specifications and finished beyond expectation. It’s just another day at Macco Motors, taking popular bikes and turning out one-off creations that are built to be loved and enjoyed; we can all drink to that!